What is the valve Shell Test (Body Test)? The valve is mounted on the test bench and shall be partially open. The valve body is subjected to the hydrostatic pressure. The result of the test will be satisfactory if no leak observed from the valve body, packing gland, etc. No leakage is acceptable. The pressure also shall not be dropped during the test. The API STD 598 refers you to the table 3 in the standard and provides the test pressure for cast iron valves based on their ratings but you know the majority of the industrial valves are made from cast steel. For cast steel, the API 598 refers you to the ASME B16.34 for test pressure. The ASME B16.34 indicates that the shell test shall not be less than 1.5 times the 38°C (100°F) pressure rating, rounded off to the next higher 1 bar (25 psi) increment. For example, if you have a valve with cast steel material (A 216 Gr. WCB) and rating of 2500, you should refer to the table 2.1.1 in ASME B16.34. The table says your working pressure is 425.5 bar at 38°C (100°F). It equals to the 6524.85 psi. Now multiply this value by 1.5 and your test pressure will be 9382.3 psi. You have to round it to the next 25 psi, and it will be 9400 PSI. On both API STD 598 and ASME B16.34 shell test duration depends on the valve size. 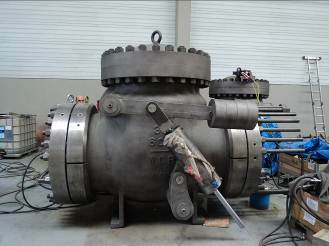 The valve size less or equal 2 inch the test duration will be 15 seconds, between 2 1/2 and 6 inch 60 seconds, between 8 and 12 inch 120 seconds and above 14 inch will be 300 seconds. The test water temperature shall be between 41°F (5°C) to 122°F (50°C). If the valve material is the stainless steel, then chloride ion content shall be less than 100 ppm. The applied pressure gages for shell test shall be calibrated and pressure gage shall not be less than 1.5 times of test pressure and not be more than 4 times of test pressure. In above example, a 15000 psi pressure gage will be appropriate, but a 12000 psi pressure gage will not be accepted since the range is less than 1.5 times of test pressure.